Jerusalem is a city holy to the three largest monotheistic faiths – Islam, Judaism, and Christianity. During Muhammad ﷺ’s life, the Byzantine Empire made clear its desire to eliminate the new Muslim religion growing on its southern borders. The Expedition of Tabuk thus commenced in October 630, with Muhammad ﷺleading an army of 30,000 people to the border with the Byzantine Empire. While no Byzantine army met the Muslims for a battle, the expedition marked the beginning of the Muslim-Byzantine Wars that would continue for decades. During the rule of the caliph Abu Bakr (may Allah be pleased with him) from 632 to 634, no major offensives were taken into Byzantine land. It was during the caliphate of Umar ibn al-Khattab (may Allah be pleased with him), that Muslims would begin to seriously expand northwards into the Byzantine realm. He sent some of the ablest Muslim generals, including Khalid ibn al-Walid and Amr ibn al-’As (may Allah be pleased with them) to fight the Byzantines. The decisive Battle of Yarmuk in 636 was a huge blow to Byzantine power in the region, leading to the fall of numerous cities throughout Syria such as Damascus. By 637, Muslim armies began to appear in the vicinity of Jerusalem. In charge of Jerusalem was Patriarch Sophronius, a representative of the Byzantine government, as well as a leader in the Christian Church. Although numerous Muslim armies under the command of Khalid ibn al-Walid and Amr ibn al-’As (may Allah be pleased with them) began to surround the city, Sophronius refused to surrender the city unless Umar came to accept the surrender himself. Having heard of such a condition, Umar ibn al-Khattab (may Allah be pleased with him) left Madinah, travelling alone with one donkey and one servant. When he arrived in Jerusalem, he was greeted by Sophronius, who undoubtedly must have been amazed that the caliph of the Muslims, one of the most powerful people in the world at that point, was dressed in no more than simple robes and was indistinguishable from his servant. 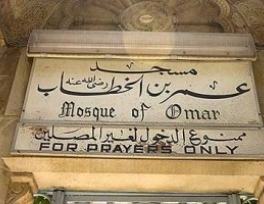 Umar immediately set about making the city an important Muslim landmark. He cleared the area of the Temple Mount, where Muhammad ﷺascended to heaven from. 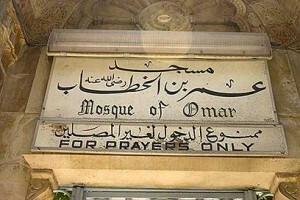 The Christians had used the area as a garbage dump to offend the Jews, and Umar and his army (along with some Jews) personally cleaned it and built a mosque – Masjid al-Aqsa – there.